This is one of my favorite dinners. It’s made in one pan with very little prep. Then it goes in the oven just until heated through. All in under 30 minutes. 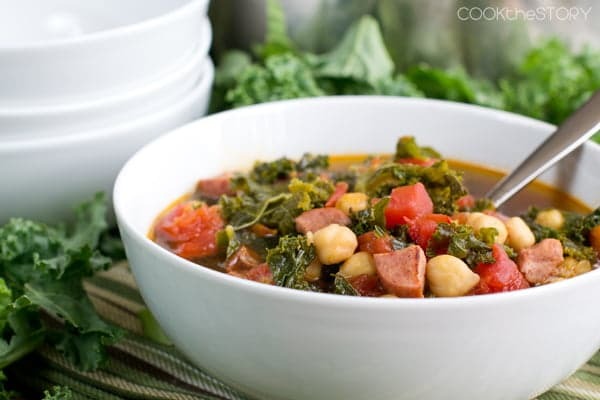 And the combination of kielbasa and chickpeas is so hearty and delicious. Years ago, my Baba gave me a cookbook for healthy cooking, Reader’s Digest Great Recipes for Good Health. I had mentioned that I was trying to cook more healthily and she thought it was a good fit. She was always giving me things like that. I mentioned that I didn’t have an electric egg beater. Well, she had a spare and suddenly it was mine. That kind of thing just happened. I miss her. In the book there was a recipe for a casserole made of chickpeas and Polish sausage. I made the recipe from that book a couple of times and loved it. 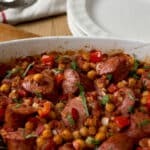 The chickpeas really take on the smokey flavor of the sausage, and the onions and peppers in there add so much flavor too. It became a staple recipe that I could make in my sleep. I definitely made it often while exhausted after a long day of chasing toddlers around! I’ve changed the recipe a bit over the years, mostly making it less healthy (lol!). The original recipe called for 2 ounces of diced kielbasa and I use 12 ounces. My recipe serves 4 people and theirs serves 2 so it’s not really that big of a difference: 1 ounce more per person. To make it healthier though, I usually use an uncured turkey keilbasa. But you can use whichever type or brand that you like the taste of, totally. Into a 13×9 baking pan you put drained canned chickpeas, some diced up kielbasa and drained canned diced tomatoes. Then add chopped onion, bell pepper and some seasonings. The original recipe called for oregano and fennel seed. I use cumin and black pepper. Both are really good combinations and worth trying. Cover the pan (use the pan’s own cover if it has its own, like this, or you can use a shallow casserole dish with cover, like this (mmm what a dream that one is! ), or use foil). Then you bake it just until it’s heated through, about 25 minutes. Because all of the ingredients are fully cooked when you start, you just need everything to warm up. Hint: I’ve even done this one in the microwave! It’s not as good but works in a pinch. 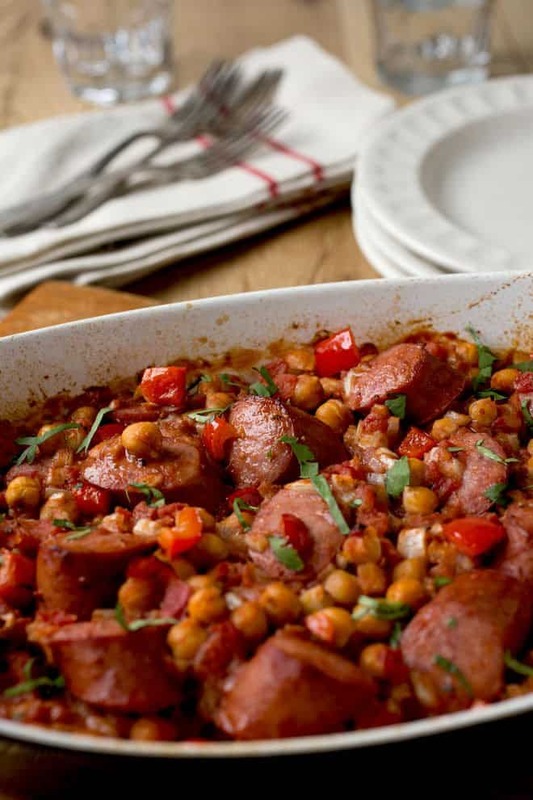 In a 9x13" baking dish combine chickpeas, tomatoes, kielbasa, onion, bell pepper, black pepper and cumin. Cover with a tight-fitting lid or with foil and bake until heated through, 25 minutes. Garnish with cilantro or chives (if using) before serving. Inspired by "Polish Sausage and Chick Pea Casserole" from Reader's Digest Great Recipes for Good Health, page 244. Photos are by Leigh Olson. Article and recipe by Christine Pittman. Disclosure: This post contains Amazon affiliate links meaning that if you click on one and buy something I receive a small commission. This is at no additional cost to you. All opinions are my honest truth. This post originally appeared in February, 2011 and was revised and republished in August, 2017. This is such a beautiful dish. i love the combo of sausage and legumes. Thank you Katerina! That combo is one of my favorites too. I forgot to add that the leftovers would make a great soup with the addition of some chicken broth. Actually, I think you may have sampled that exact leftover soup a week or so ago. The chickpea leftovers and the couscous leftovers with chicken broth worked really well together. Today, the fam and I had that exact same thing for lunch but it also had some leftover roast pork and potatoes in it, an Everything but the Kitchen Sink kinda soup. Way too good! Remind me to tell you about my chicken stock revelation too! There seems to be endless ingredients you can substitute in this recipe. Delightful. I think I would even serve this cold on a hot sunny day. I’ve never thought of doing it as a cold salad. Great idea! Maybe with a bit of lime juice and olive oil. I’d probably skip the sausage then. Oh wait. This would be the PERFECT side dish for a grilled sausage in a bun. Thanks for the idea! This is *my* kind of comfort food, right here! I think I’ll try it with the added curry, because I have a curry addiction I need to take care of, and sub out the black beans. I love black beans, but they don’t love me. ‘Nuff said. With the curry and without the black beans would be great. To take it further you could use a sweet onion and add 1/2 to 1 cup raisins, 2 cloves sliced or roughly chopped garlic, a few handfuls of fresh spinach (it’ll wilt down) and 1/4 tsp cardamom or a dash of cinnamon and a bay leaf or two. That would be awesome with plain basmati rice or wrapped up in warm naan bread. Oh, yeah. Brown basmati is my go-to rice. You seem to know me . . . have you been rifling through my cabinets? Hahah! 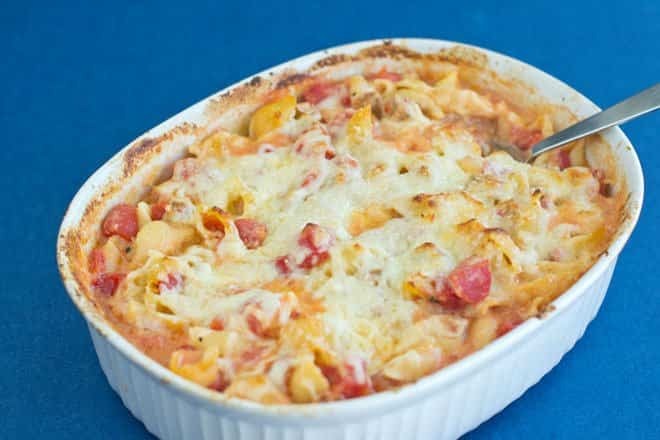 I’m always up for a good throw together meal with lots of substitution options! We eat a lot of couscous, too. Yeah, I love having a recipe (or general meal concept) that I can play around with based on what’s on hand. Makes mid-week so much easier to face if you have a few of these in your repertoire. Thanks for reminding me about couscous. Any dish that involves boiling water and then waiting for five minutes needs to get back into my dinner rotation. You’re welcome. It is too easy for words. And satisfying. And versatile. You can even get whole wheat versions these days (they take longer to cook).